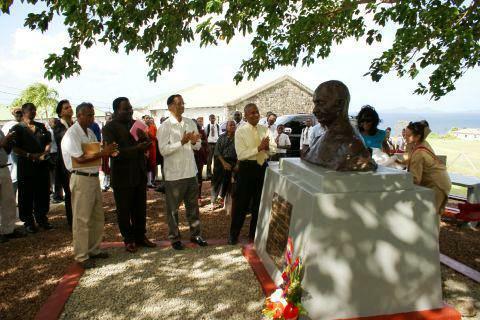 The Grenada Government in collaboration with the Government of India unveiled a “bust” statue of Mohandas Karamchand Gandhi on the grounds of a secondary school overlooking the Sauteurs Bay where Indian descendants arrived more than 100 years ago. Mohandas Karamchand Gandhi (2 October 1869 – 30 January 1948) commonly known as Mahatma Gandhi, was the preeminent leader of Indian nationalism in British-ruled India. Employing non-violent civil disobedience, Gandhi led India to independence and inspired movements for non-violence, civil rights and freedom across the world. “Gandhi’s life is an example to us all and his legacy, a positive influence to all Grenadians, especially the youth in these times of increasing violence,” Prime Minister Tillman Thomas said at the unveiling of the bust. “The figurine is that we remember all who contributed to this island in one way or another, he is a hero in India and I recognize by Indian all over the world, so this is our respect to him,” he adds. Among the many dignitaries at the ceremony was Malay Mishra India’s High Commissioner to Grenada and members of the Indo Grenadian Heritage Foundation. Less than 5% of the island population is Indians. India through bilateral arrangements has continuously contributed to the development of the country.